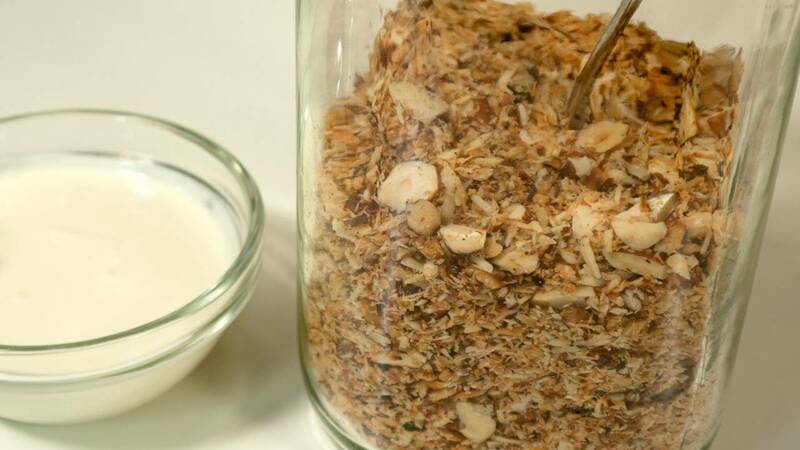 Video Recipe - A müesli without oatmeal is a pure luxury. It is easy to make and it tastes good to boot. However, it is an advantage if you are able to use a kitchen machine with a vegetable slicer. Otherwise, it will take its own sweet time. 2 cups (5 dl) dried fruit. Do not roast. 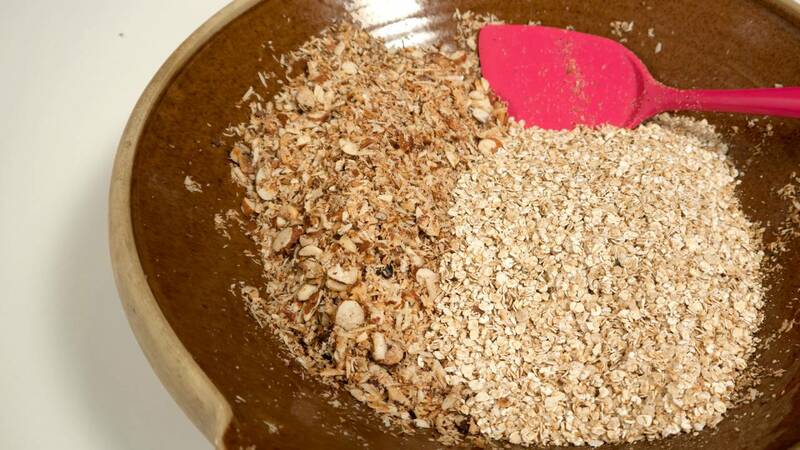 1 lbs (600 g) oatmeal. Add 3 additional tablespoons of coconut oil and roast it in 2-3 portions. 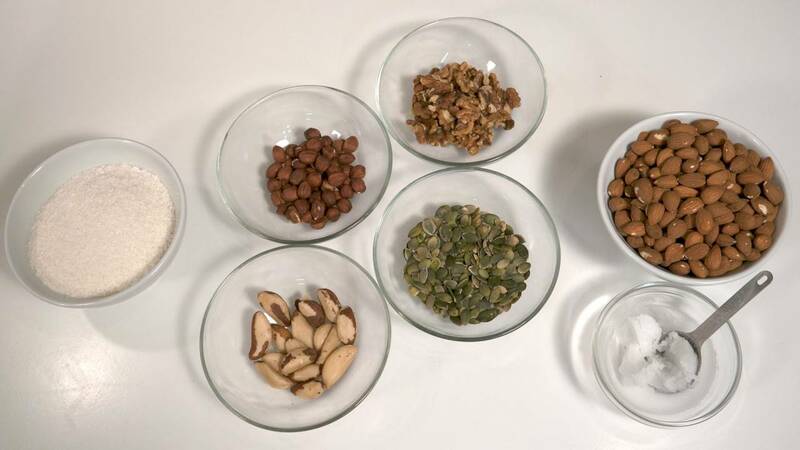 Slice/cut all the nuts and grains to a thickness that you would be comfortable eating at your breakfast or with fruit and/or yogurt. You can easily do this with a knife, but it takes time. It is the perfect job for the vegetable slicer attachment for your kitchen machine. If you are lucky enough to have one of those. You may also be able to use the vegetable slicer on a regular food processor. The slicer will ensure that you get both fine and coarse pieces. Just like you would want in a müesli. Toast them in a frying pan at a relatively high heat. I do it in 3 portions. 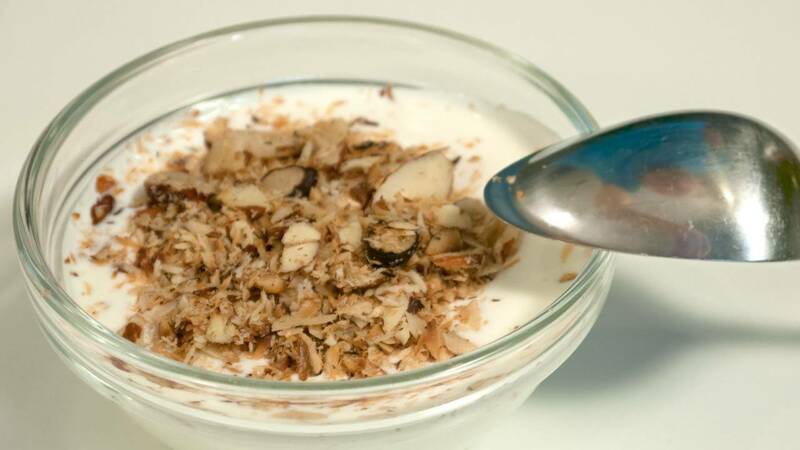 Almonds, nut-mix and the coconut meal separately. Otherwise, it does not fit in the frying pan. It also makes it easier to avoid that parts of it goes untoasted while other parts are burned. Put in 1 tablespoon of coconut oil per roasting. Turn it over regularly with a spatula, or by turning it in the air, a bit like a pancake. The nüsli is quite forgiving of when adding extra nuts and grains. So just use what you have, or are able to buy. And then add 1 tablespoon of coconut oil per 7 oz (200 g) extra nuts. Beware! It burns quickly if you do not turn it regularly.